As humans, we like to access our inner animalistic behaviors from time to time and in effect, resemble actual animals. Perhaps, we lick our plate after a delicious meal or we climb trees just because it’s fun, or maybe we hop around shouting, “oooh-oooh, eee-eeee, aaaah-aaaaah,” in a game of charades or perform bear crawls because we read somewhere that it might strengthen our core. Whatever it is that has us reverting back to our animalistic insticts, it has not gone unnoticed. Our animal counterparts are wanting to repay us the favor and show us that they, too, can act like humans. They have watched us doing “human things” for so long that they seem to have perfected a lot of our unique behaviors. Here is a collection of animals doing just that–perfecting human behaviors and actions like they’ve been doing them for years. We present you, the many “Manimals” of the world. 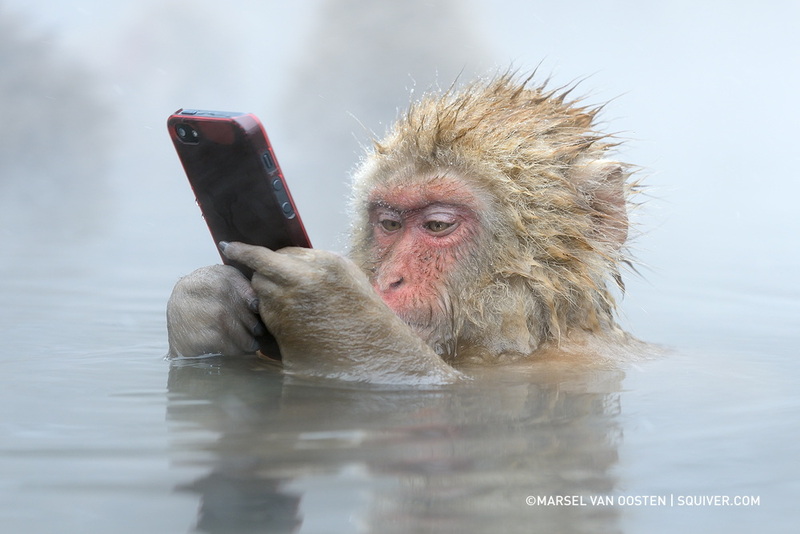 After seeing thousands of tourists staring at their smartphones, this monkey in Japan wanted to see for himself what all the fuss was about.